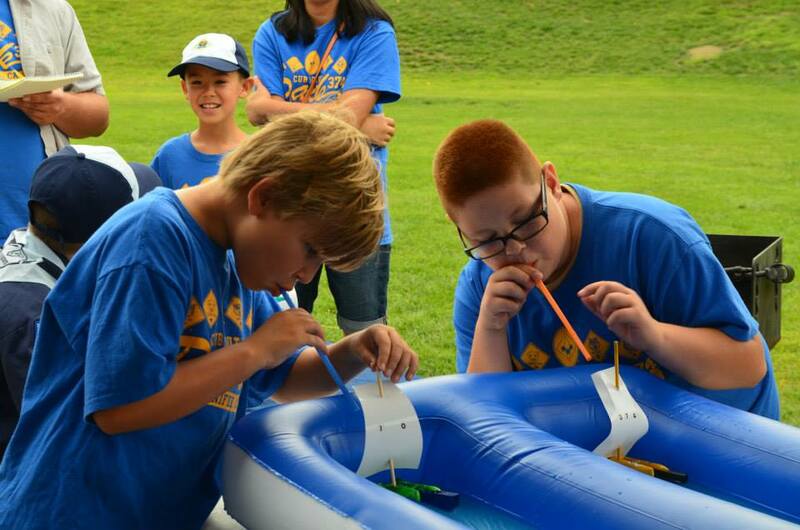 Jeremiah and his friend Cesar race their Regatta boats. It means several things to us when summer time comes to our house. 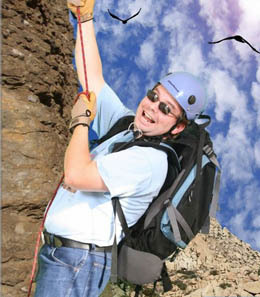 For example, kids getting out of school, unavoidable heat, and of course, an impending Cub Scout Raingutter Regatta®. My kids always get a kick out of it and as a parent, I like to see them strutting their stuff. Everyone knows that if you get a group of boys together in one place, the tone quickly turns competitive. Whether they are feats of strength, speed, stamina, or just plain foolishness, boys are always trying to one up each other. For those unfamiliar with the Scouting program, Cub Scouts are boys in first through fifth grades. Among the common activities Cub Scouts participate in to develop a healthy sense of sportsmanship and positive competition are the Derbies. 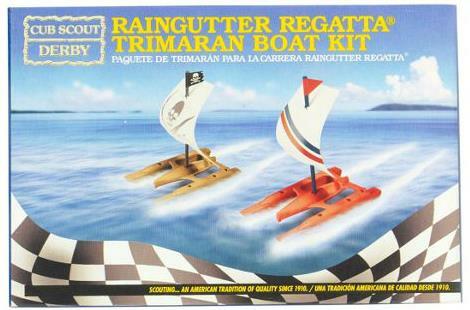 We have a Pinewood Derby® with wooden model race cars, a Space Derby® with wooden model rockets, and of course a Raingutter Regatta®, which is a lung-powered wooden model sail boat. 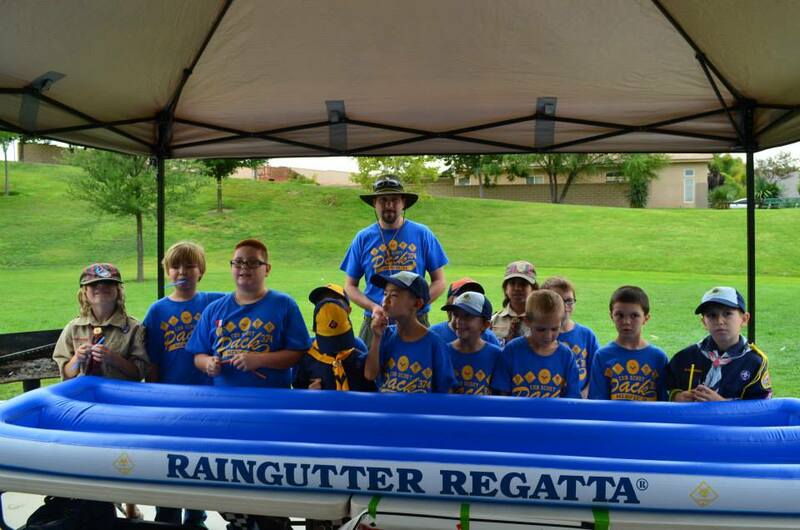 Most Cub Scout Packs today use an inflatable “gutter,” though we have used traditional capped rain gutters before as well. I have to say that these are far more stable than their predecessors, which have a tendency to tip over. The boys start with two wooden pontoons, sand them down, attach the plastic body, affix the mast and sail, paint and decorate. This last Sunday, July 21, the boys of Pack 374, chartered by Menifee 24/7, descended upon La Ladera Park in Menifee. We set up canopies and tables of food. The afternoon kicked off with a potluck, while some of the leaders set up the “track” and got ready for the fun. After a healthy dose of hot dogs, hamburgers, and potato salad, the boys pledged their Allegiance to the Flag. The boys raced, had a good time, displayed good sportsmanship, and won some awards. When the boys were done with their races, the track was opened up for friends and family members, who also made boats and wished to race. As the race came to a close, the skies opened slightly and it began to drizzle, breaking up the slight humidity that had been present all day. We closed with a prayer, packed up our belongings, and had the boys do a “Leave No Trace” sweep of the ground. We left the area as good or better than we found it, and went home. To the boys, it was a day of fun and competition, but whether they know it or not, the crafty parents snuck in some lessons, too. Cubmaster Chris and the boys of Cub Scout Pack 374.